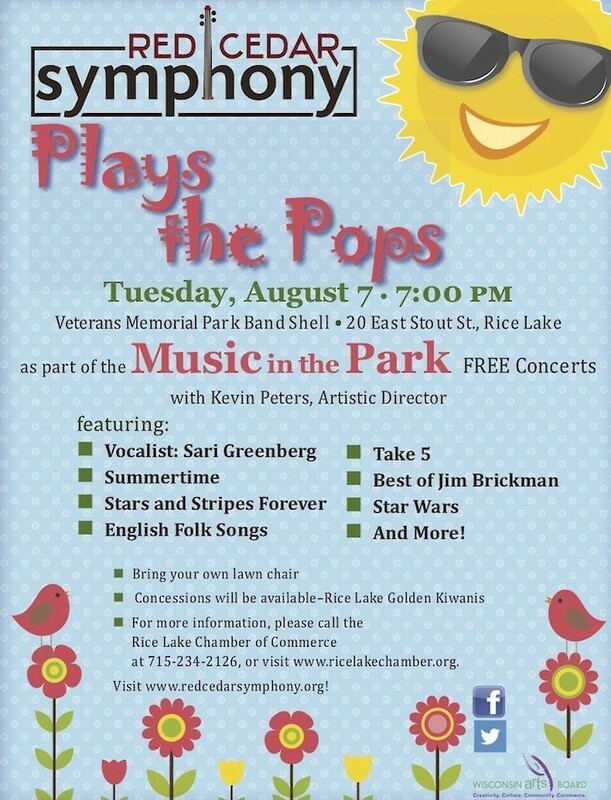 BARRON COUNTY -- From Stars and Stripes Forever to Star Wars, with Elvis, Vaughn Williams, Jim Brickman and more in between, there’ll be a little something for everyone at the Red Cedar Symphony’s annual free concert in Veteran’s Park, Rice Lake, on August 7 at 7 pm. The RCS is especially pleased that vocalist Sari Greenberg will be joining us to perform George Gershwin’s Summertime. Bring a lawn chair and settle in to enjoy live and lively music performed by a full orchestra, outdoors on a summer evening. The Kiwanis concession stand will be on hand to provide refreshments. This concert is part of the annual “Music in the Park” series sponsored by the Rice Lake Chamber of Commerce. Established in 1983 the RCS is based in Rice Lake and also performs regularly in other communities in the region. Musicians in the orchestra are drawn from throughout northwestern Wisconsin, including Cumberland, Ladysmith, Spooner, Exeland, Chetek, Trego, Springbrook, Bruce, Hayward, Winter, Bloomer, Chippewa Falls, Eau Claire, and Osseo. For more information, please visit our web site at www.RedCedarSymphony.org.